1. 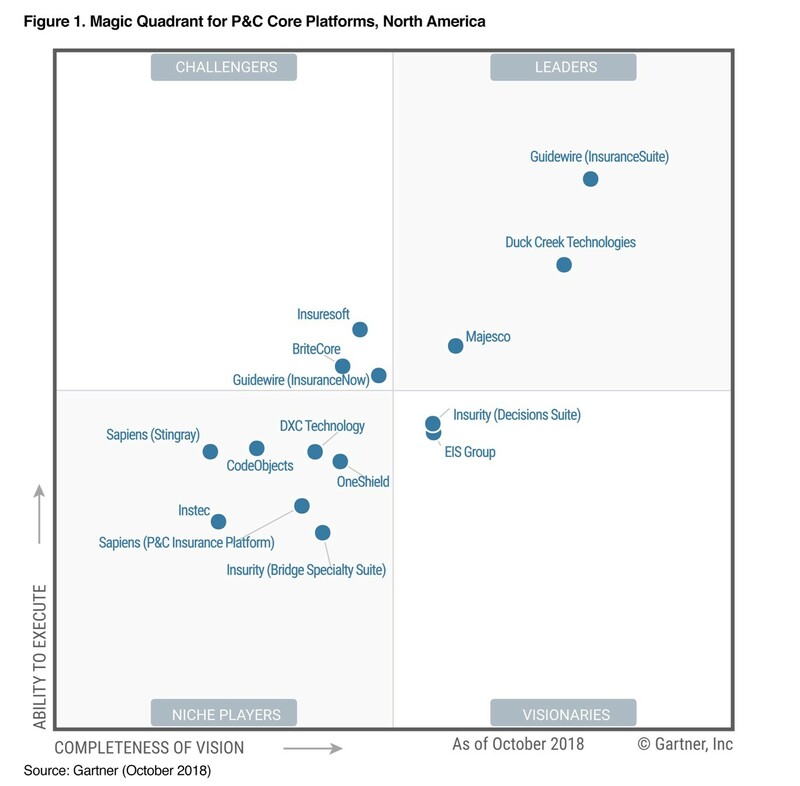 Gartner Magic Quadrant for P&C Core Platforms, North America, Jeff Haner, 9 October 2018. 4. The above graphics were published by Gartner, Inc. as part of a larger research document. 5. Gartner does not endorse any vendor, product or service depicted in its research publications, and does not advise technology users to select only those vendors with the highest ratings or other designation. Gartner research publications consist of the opinions of Gartner’s research organization and should not be construed as statements of fact. Gartner disclaims all warranties, expressed or implied, with respect to this research, including any warranties of merchantability or fitness for a particular purpose. 6. GARTNER is a registered trademark and service mark of Gartner, Inc. and/or its affiliates in the U.S. and internationally, and is used herein with permission. All rights reserved. 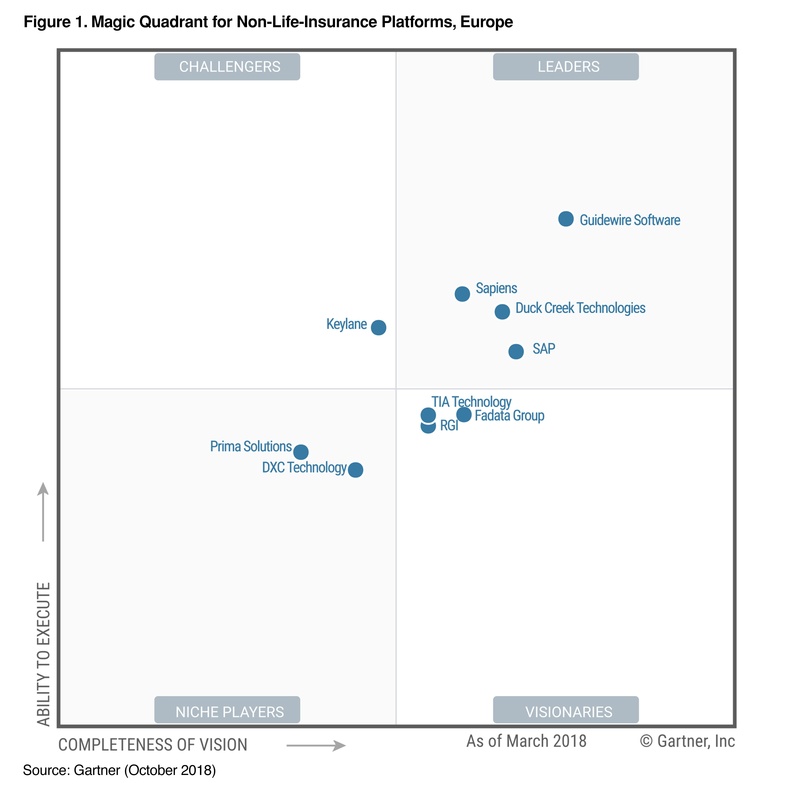 Duck Creek Technologies paves a genuine path to the future for P&C insurance companies. Decades of insurance experience underpin advanced technologies specifically designed to accommodate change – allowing carriers to navigate uncertainty and capture market opportunities faster than their competitors. Duck Creek solutions are available standalone or as a full suite. All are available via Duck Creek OnDemand, the provider’s SaaS solution for the P&C insurance industry. © 2018 DUCK CREEK TECHNOLOGIES. ALL RIGHTS RESERVED.